The Big Idea: Little ones are learning every day. You can help them develop language skills in fun ways at every age and stage! There are so many opportunities to talk with little ones all day long as they grow. So you can: Talk to baby a lot! Look her in the eye. Enjoy her responses: a waving arm, a smile, kicking legs, and so on. Talk back using words (“What a strong arm!” “Thanks for that sweet smile!”). So you can: Talk during meal times. A newborn’s cry to be fed is the beginning of communication and conversation! Babbles and coos are his language as he plays with sound. As you make sounds back at him, he will slowly begin to imitate them. So you can: Fill everyday routines with talk. Build vocabulary by describing what you’re doing (“One sock…two socks. Now we can put on your shoes.”). So you can: Acknowledge “nonsense” words, such as ba ba or ma ma, by repeating them or extending the idea (“Yes, ba, ba. Baa, baa black sheep!”). 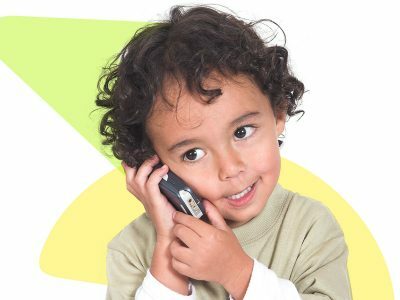 So you can: Give toddlers a toy cell phone to play with and “copy” your conversation style. So you can: Close your eyes and explore with your ears! Say, “Let’s listen carefully. What do you hear?” Take turns naming the sounds around you (cars, doors, people). So you can: Notice sounds around the neighborhood and talk with children about who or what might be making them. So you can: Talk to children about whom they might like to send a message to and what they would say. Then write an e-mail together!